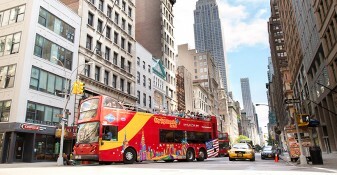 • Hop-on, hop off double-decker sightseeing tour of Downtown Manhattan with professional guide. Discover the best of the Big Apple with a complete sightseeing tour of Downtown Manhattan and the opportunity to visit a brand new attraction! Our convenient tour allows you to hop off and explore the city at 21 locations throughout Manhattan, then hop back on the next bus when you’re ready to continue your tour! This makes transportation and sightseeing easier than ever!